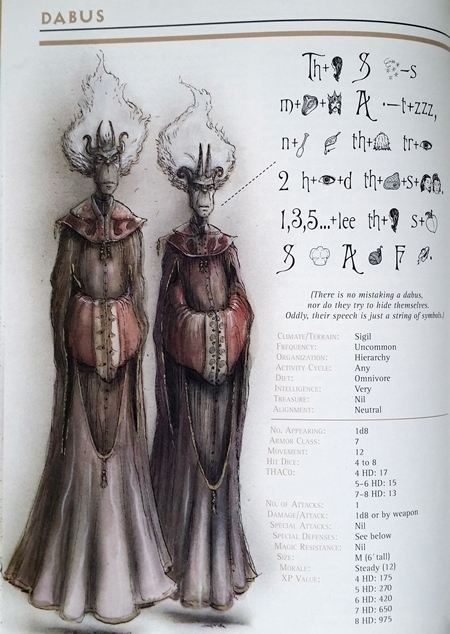 My copy of the Planescape Campaign Setting arrived this past weekend, and I had a chance to spend some time looking through it. 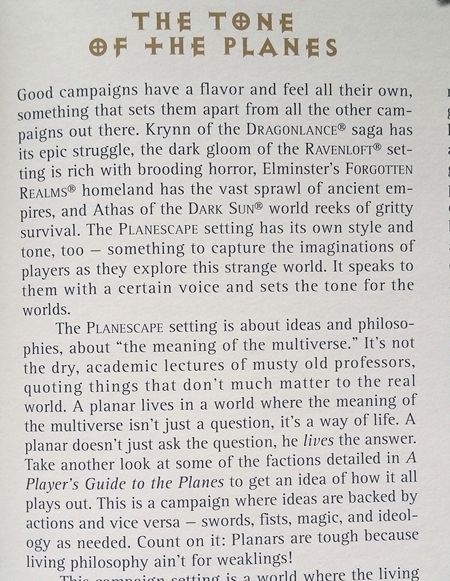 My first impression is that Planescape packs a punch. The guts are classic 1990s TSR: four saddle-stitched books, four poster maps/thingies, and — somewhat unusually — a GM’s screen. 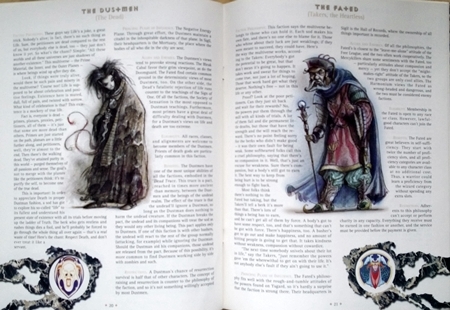 The books are A Player’s Guide to the Planes, which is actually the introduction to to the setting for players and GMs; A DM Guide to the Planes, which is what it says on the tin; Sigil and Beyond, which is the introductory book writ large and aimed at GMs; and Monstrous Supplement, which covers iconic planar critters. The other books are just as good, but do different things. I haven’t read much of them yet. 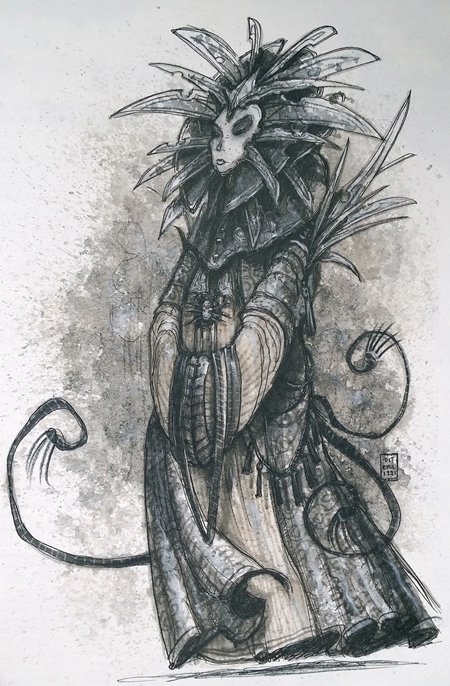 Planescape has one designer, David Cook, and one interior artist, Tony DiTerlizzi. 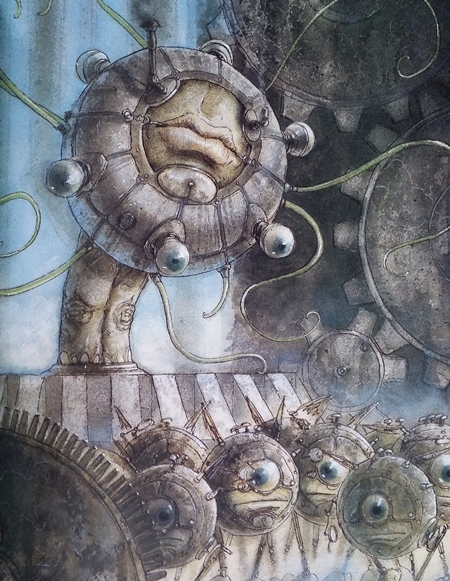 DiTerlizzi’s art is lovely and distinctive, and conveys the tone of the setting like no one else could. No surprise from the designer of the Basic D&D Expert Set (half of one of my favorite editions of D&D), Cook’s writing is clear, direct, and also fantastic at conveying tone. One interior illustrator, one designer. Talk about unity of vision and purpose! And it shows. 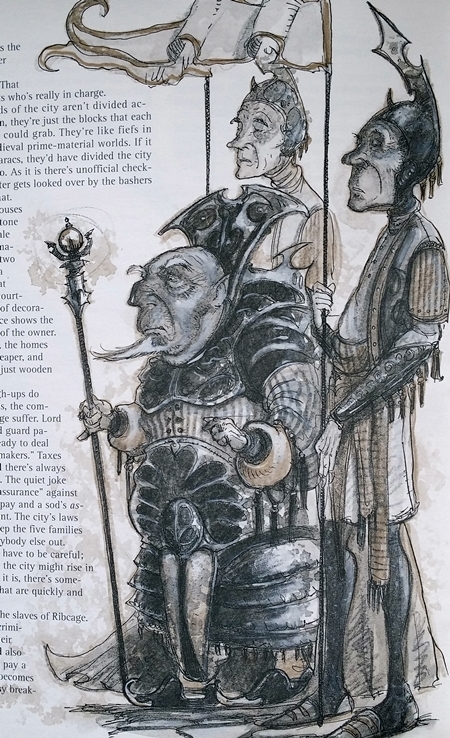 Planescape feels like one of those movies where you just can’t imagine anyone else in Role X: I get the strong impression Planescape without this specific creative team wouldn’t work nearly as well. There’s the love-it-or-hate-it planar cant to contend with, yes, but so far that’s not bothering me at all. I’m enjoying reading these books. Sigil is awesome! It’s a big part of what attracted me to this setting. Imagine a tire — no hubcap or wheel rim — lying on its side. Sigil would be built on the inside of the tire. All the streets and buildings would fill the curved interior. Meanwhile, on the outside, there’s nothing, see? And that city-filled tire? 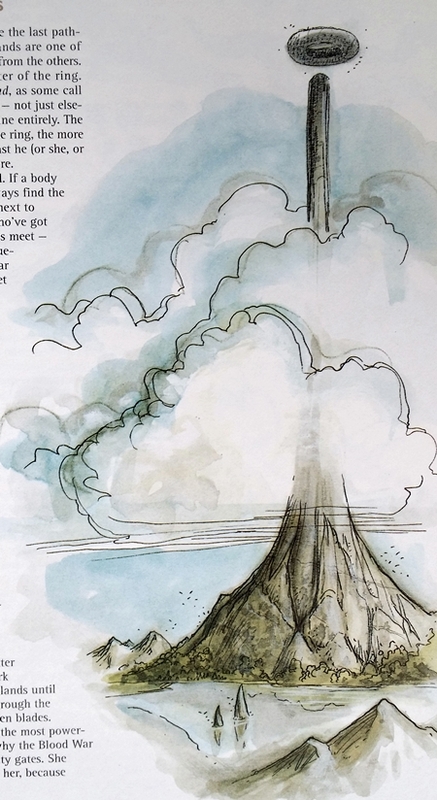 It hovers above the top of an infinitely tall spire at the center of the Outlands, and the only way in or out is through portals — magical doorways to other planes, worlds, and everything in between. 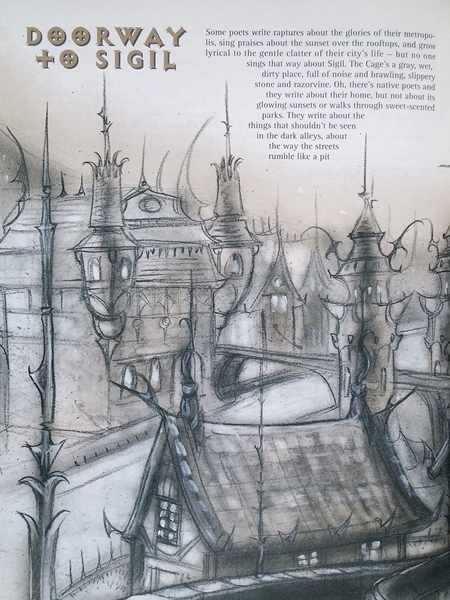 From what I’ve seen of it so far, Sigil is one of the coolest fantasy cities ever created. I’ve been thinking about running Planescape as a gold-for-XP sandbox, which I knew ran a bit counter to its nature. That’s part of the appeal. Part of me bristles, part of me agrees, and the rest of me is still turning Planescape over and seeing what clicks. I see Cook’s point. 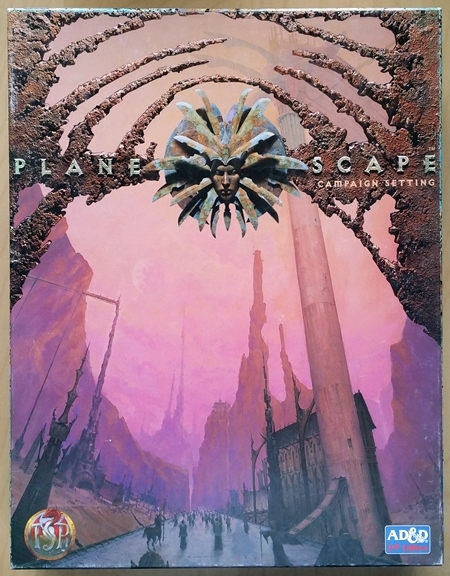 I’ve heard Planescape described as TSR’s answer to their biggest rival in the 1990s, White Wolf, and the glove pretty much fits: evocative, boundary-pushing setting; factions that disagree about the nature of reality, and to which every PC likely belongs; intraparty conflict; marvelous artwork used well; etc. In that light, I’m not sure a gold-for-XP would work. But a different sort of sandbox? Absolutely. Sigil is made for sandbox play. Everything I’ve read about it so far screams SANDBOX ME. Whatever I wind up doing with it, Planescape is shaping up to be one of my favorite TSR settings. I see what all the fuss is about, and I dig it. 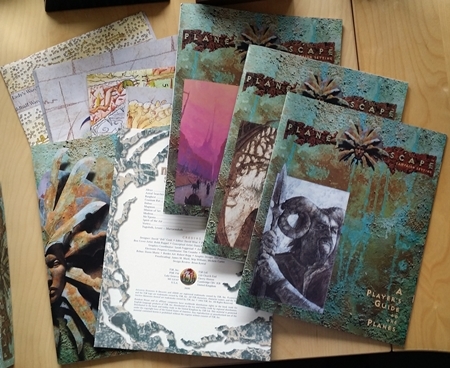 When I ran Planescape, it was run as a non-traditional sandbox. We were in high school, so the game was mostly power-fantasy, but a lot of it was about going to new places, experiencing what was there, and maybe taking home some of the wonders from this new place. My players ended up with a bit of a menagerie – I know we had a “pet” modron at some point, as well as a chunk or a Archon(?) cube that had its own directional gravity. I guess in a way, we played a corrupt form of Minecraft. That sounds like a fun sandbox! 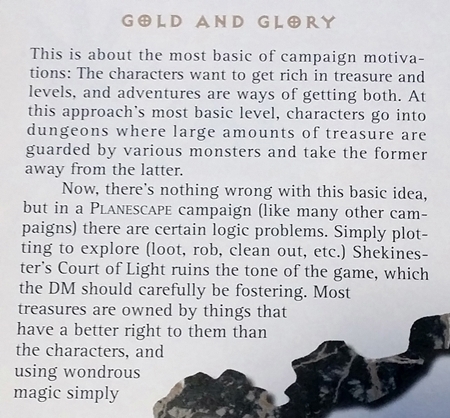 So to sort of separate how it was run: a traditional sandbox seems to follow the “find something unexplored, explore it, get loot” system; the planescape style was more “learn about something new (players and chars! ), find out how to get there, gain some boon”. Because I like religious things, I did tend to bestow a lot of boons from Powers, sometimes single-use blessings or permanent stat bonuses.